If you have young children in your life, make time for the Acorn Store. The awe-inspiring selection of colorful, well-crafted wooden toys is guaranteed to charm kids and adults alike, and the toys will inspire hours of old-fashioned creative play. The Acorn Store is a specialty store that offers a toy selection for young children and can be found in Downtown Santa Monica. For a treasure trove of affordable imported goods from Nepal, Tibet, and India, stop by Kathmandu Boutique. There you’ll find lightweight linen pants and breezy kurtas, scarves, bags, jewelry, home décor, and bohemian gifts galore. Surrender yourself to the boldly curated selection of women’s clothing and accessories, gifts, and décor at the appropriately named Hip’tique. From over-the-top to just plain funky, Hip’tique’s inventory hits every note. 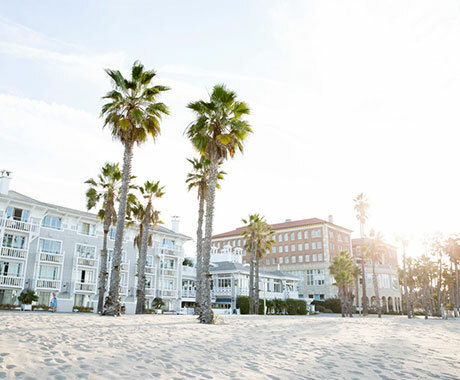 This Santa Monica original has recently opened a second Southern California location. ZJ Boarding House started as a hole-in-the wall surf and skateboard shop in 1988 and remains a favorite of local surfers and skaters today. Staffed by experienced surfers and skaters, ZJ Boarding House offers surfboard rentals and a large selection of boards, wetsuits, gear, and apparel for purchase. 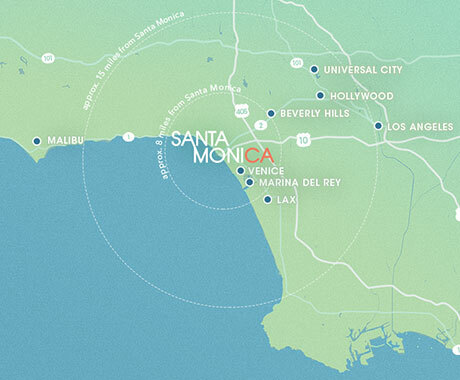 Santa Monica’s shopping mecca, Santa Monica Place, leaves no stone unturned when it comes to fulfilling guests’ desires. Treasure-seekers should check out unique shops there such as America’s first Chan Luu boutique, which offers the designer’s cult-favorite cashmere and silk scarves, fashions, and jewelry, and b8ta, a showcase for tech products where you can try and buy the latest innovations. In need of a sightseeing recommendation or a dinner reservation? Text the Concierge (310-499-2928) for assistance in English, Spanish, or Mandarin. Or visit the Concierge Lounge on Level 2 to rest your feet. For a nominal fee, the staff can arrange to have your shopping parcels delivered (within a 10-mile radius) to your home, office, or hotel that same day.